Year after year, the repairs and refitting sector has increased its workload to the extent that some yards now prefer to completely or partially abandon building of boats to dedicate themselves to this more profitable business. It offers, in fact, the advantage of not having to search out clients, as the work entails meeting the needs of those interested for whom it is often difficult to find professional experience and adequate wharf space for the size of boats involved. Alfa Yachts Yard, located in the renovated part of Genoa port towards Sestri and adjacent to Cristoforo Colombo Airport, carries out the above activity, to which it adds a specialisation in motorization and mechanical apparatus for large boats and pleasure craft, with the exclusive for Caterpillar in Italy for engines and Quantum for stabilising systems. This is made possible precisely due to the spacious wharves and the importance of the structure, equipped with the most up-to-date apparatus. Increasing development of the business has forced the company to look around and recently it has acquired a new wharf to the west of the yard, meaning that more new work prospects now open up. We spoke of this with Guido Genetti, the yard's "CEO". That's right. At the moment for example, we are working on a boat under guarantee on behalf of the Amel boatyard and work requested by the owner on "Lady in blue", a 54-metre Amel, up to a few years ago owned by Briatore, who then sold it to buy an 80-metre. Do you work for many yards? Quite a few. But with all yards, in general, there is no exclusivity. They choose the sub-contractor, who must in any case be able to offer every assurance of efficiency and quality based on the technical requirements, the kind of work to be carried out and the logistic preferences of the company or owner. Is there a lot of competition? I would say that on an international level there's a lot, also because many yards have recently "discovered" refitting. We are saved by the fact that for this job you need large spaces, long jetties, adequate structures onshore and continual technical up-dating on all the services we offer, from finishing work on engines to all the other systems, etc.. However, we must be competitive as far as price is concerned. In this way we have made a name for ourselves, to the extent that Lurssen, instead of calling Caterpillar assistance from Germany, regularly calls for us to go and work on their premises on new or refitted constructions. We are also setting up a very active after-sales service with Amel. We worked on "Kermit" after its guarantee had expired, but with the full approval of the yard. Then, until last month on "Ilona", a 74- metre, with direct guarantees with Amel for all the Caterpillar components and mechanics in general in the engine room. The boat has now been transferred to the United States and the skipper sent me an e-mail to thank us: "Everything is perfect". Do you often get thank you notes? Lots, some referral and some thanks from yards and super-yacht skippers. Many super-yacht masters use word of mouth, which for us is very important. They know that we aim to offer maximum satisfaction, also due to the choice of the wharf easiest for them to reach. We have become the exclusive service point for the Ferretti Group for large boats: the Riva starting at 60 feet, the Ferretti Custom Line at over 24 metres and the CRN, and we all know how big they are. Recently we have also started with Pershing, in charge of after sales service for the Pershing 88, which they showed at Genoa. We reckon on receiving about sixty Pershing a year through our yard. Which travel lifts do you have? A 450-tonne, plus 10% margin, so we can go up to a limit of 495 tonnes. Which means you can handle boats up to...? Fifty metres. Also because over and above these lengths, using a travel to manoeuvre them becomes much more delicate than working in the dock. Often the clients themselves request the classic wet dock rather than lifting with the travel. In the case of a Pershing 88', what do you do? Do you haul it and position it? We can haul it using our self-propelled 100-tonne crane or place it on one of our 90-tonne hydraulic trucks, which means we can move it into the shed. For quick work on the other hand, we lower the parts onto the wharf side. If, for example, we have to remove an engine to put in a new one or to work on it, we lower it onto the wharf alongside the boat and we work in loco. This is an operation that takes ten days and it avoids heaving it about with the low loader. 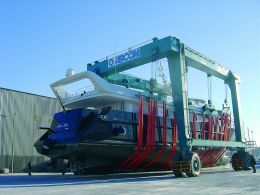 So over-35/40-metre boats we haul with the travel lift and position using the travel lift, while those under 35/40 metres we lift with the travel lift, which works like a lift and once positioned on the low loader this takes them where they have to go. We have ordered a 180-tonne low loader which will be delivered shortly in December from Ascom, especially for these manoeuvres. So come the new year, we will reserve the Alfa Yachts Yard hardstand for large boats, which the less you move them the better. Whereas the others we will haul into our wet dock and then, with the low loader, we can take them to the new area, where we have another 10,000 sq/m at our disposal. What is your total capacity now? Our yard has a capacity of 80 berths in the water up to 18 metres, but we have an agreement with other structures in the port for other spaces, even for about ten or so boats up to 75 metres. Do you also work on small boats? Sure, starting with six-metre boats. Even if our core business is on larger sizes, small-medium boats still represent 35/40% of Alfa Yachts Yard's turnover. It is by no means a second league business, quite the contrary, right inside the structure on a staff level, there are people who work exclusively on mooring and management of small boats. It's not something we do in our spare time, as a second line. Have you heard that Fincantieri is also looking to build large pleasure craft? Of course, in practice we already knew and this was one of the reasons we decided to make this new investment: our wharves will be able to house them when it becomes necessary. On yard premises the 10,000 sq/m combined with the new wharf, and 100 metres of wharf mean being able to accept nine 50/60/70-metre boats. Can you tell me something more about the agreement you have with the American Quantum? It was very important for us to get into contact with this reality, leader in the sector of stabilising systems, both when sailing and when at anchor. It is a partnership that means our work is further qualified, seeing that in this way we become benchmark in the Mediterranean for all the boats that use their apparatus, guaranteeing assistance that is absolutely in line with the standards ensured by the parent company in the States. I can't hide the fact that we expect a good return on this operation, given that Quantum systems are installed on many of the large pleasure craft in circulation. Having the opportunity to carry out work on these boats will enable us to get our structure known even more quickly by all those owners and above all by skippers who don't yet know us. Then it will be up to us and our skills to make Alfa Yachts Yard become their customary assistance centre, not only for their stabilising systems. How are you equipped on the other hand for assistance outside your yard? We have a group of 55 people, direct employees and operative, with 8 trucks kitted out as workshops and a total of around twenty vans and smaller means of transport, for outside work within a range of 500 kilometres. Any further and we fly there. Have you set up collaboration with other companies in the sector? This has been necessary, especially for large jobs. For about a year now, we have been working together with Arredamenti Porto and its general manager Matteo Costaguta. We share the work both on a production level and on a management level and we manage it together right from start to finish. In the context of the Genoa port, are all the indispensable professions available? Yes. What is good about Genoa, and in the Genoa basin is precisely the availability and the skill of the labour of the sub-contractors. While Viareggio is an area where they build new boats, Genoa is more of a refit location; this is shown by the operators present. Going back to expansion of the refitting business, what percentage of your turnover does it represent? Last year 25%, this year, we think about 50%.